This course covers techniques for the use of quantitative models for mineral processing unit operations, and the simulation of the steady state operation of mineral processing plants. Simulation provides a useful tool that mineral process engineers can use to identify and solve a variety of operational problems. However this tool must be used carefully and with understanding and proper training in its use is usually essential. This course is aimed specifically at this need and the emphasis will be on practical simulation and the interpretation of data that is produced by the simulator. The course is structured to provide comprehensive practice with the Modsim simulator. Course participants are required to obtain a license from MTII for the latest version of Modsim. The student version provided in the book Modeling & Simulation of Mineral Processing Systems can also be used, and most exercises should be fully compatible with the student version. The modeling methods and data structures that are used in MODSIM will be thoroughly explained and discussed. Participants will learn how to interpret information that is produced by the simulator and how to apply it to the solution of practical operating problems. Technical and economic optimization will be discussed. This course is offered through the Internet and at the University of Utah once an year. It is open to engineers and technicians who are involved with the processing and recovery of minerals. The course is designed to be taken at remote sites and is accessible to anyone who has access to the Internet. No prior experience with simulation techniques is required but participants must have a basic understanding of the operation of ore dressing plants. Each participant must have access to a computer running under Windows 95/98, NT or XP and equipped with a suitable web browser. A sound card and speakers will be an advantage. Participants must also have Adode Acrobat 4 Reader installed. This is available free of charge from www.adobe.com. This course is divided in 10 Modules and should be planned in a one module per week basis. Each module is more or less self contained and cover a specific aspect of simulation. About 4 hours of work will be required to complete each module but participants should budget some additional time for experimenting with the simulator and applying it to their own specific problems. Licensed users may send e-mail questions regarding the course materials and exercises, as well as submit work for evaluation. The course is ciurrently maintained by Dr C L Schneider of the Department of Metallurgical Engineering at the University of Utah. Dr. Schneider has had wide experience with simulation systems and is experienced in the development of mathematical models for mineral processing operations. This course is based on the text Modeling and Simulation of Mineral Processing Systems by the course instructor Dr R P King. All course participants should have ready access to this text during the course because frequent reference will be made to it. The MODSIM simulator is included on a CD that is published with the book and this is the most convenient way to obtain this software package. The modeling principles that are discussed and used in the course are comprehensively described in the text. 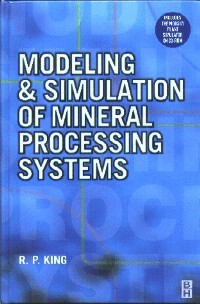 Modeling and Simulation of Mineral Processing Systems. To order direct from the publisher click here. What is simulation and why is it the most significant engineering tool of the 20th century? Orientation with WebCt structure and browsing techniques. Learning to use MODSIM graphics editor. Particle populations and their description. Distribution functions and mineral liberation. Special considerations for data used in coal washing plants. Performing simulations and interpreting simulator output. Modeling and simulation of crushing and grinding plants. Modeling and simulation of gravity separation plants. Dense medium separations - baths and cyclones. Autogenous gravity separations - jigs, sluices, Riechert cones, water-only cyclones and spiral concentrators. Modeling and simulation of flotation plants. Flotation plant structure and plant specification by grade recovery relationships. Models for SAG and FAG mills. Models for ball and rod mills. Simulation of open and closed loop milling circuits. Simulation of combined comminution and concentration plants including regrinding. Putting it all together - simulating complex plants. Calibration of models against plant data. Use of Virtual Laboratory to design experiments for model calibration. Simulation of plants of interest to participants. Participants will have the opportunity to simulate plants in which they have specific interest.